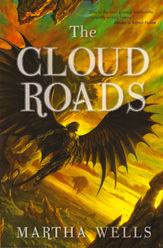 Books like The Cloud Roads by Martha Wells are why I love fantasy literature. In The Cloud Roads, Wells has built a world where people aren’t just divided by color and language, but by species and life-cycle. In a surprisingly short time, Wells touches on the kinds problems that a world like hers would have, and populates it with compelling, believable characters who provide the driving force behind the narrative. Our hero, Moon, is surrounded by people from a hundred different races — but no one who looks like him. There is one species whom he resembles: The Fell, a race of flying predators. Moon rarely gets to stay in one place for long, because eventually someone notices that, hey, this guy can shapeshift into a big flying dragony thing, kind of like the big flying dragony things that smashed up our city and ate our families. Once someone notices, it’s just a matter of time before Moon has to move on. Every time he moves, he has to integrate with an entirely new species. Living alone and constantly under suspicion of being a ravening beast has made Moon into a deeply suspicious person. He never overlooks the possibility that people are simply lying to him, either out of malice or because they want to use him. Wells is careful to show the reader that Moon’s suspicious nature isn’t just a personality flaw — his instincts save the day more than once. Despite everything, Moon is a basically decent person, which helps keep him sympathetic through his moments of self-pity. Martha Wells seems to have mastered the trick of making every character in The Cloud Roads sympathetic, even if only when seen from a particular angle or at one moment in the story. Some people will have trouble with this book because there aren’t any humans in it. However, there are more three-dimensional and fully-realized characters in The Cloud Roads than I’ve seen in some books that only feature humans. I even caught myself feeling bad for the Fell. Sure, they’re murderous cannibalistic monsters, but they can suffer (I still cheered when Jade ripped a Fell’s head off — regardless of pathos, rampaging cannibal monsters make lousy neighbors). Jade isn’t the only kickass woman in this book. It’s always a relief to see women written as people, rather than as collections of stereotypes — particularly when they’re fierce shapeshifing dragon-women. The women in The Cloud Roads are just as flawed and just as compelling as the men. I could see Wells having fun with the gender roles in her society — Moon’s place, when he finally finds it, was such a wonderful twist that I will not spoil it here. Wells’s writing is straightforward and functional. The reader will be working hard to understand this complex alien world that Wells has built, and so she doesn’t waste time with literary distractions. The Cloud Roads is Moon’s story, and never strays from his point of view. The pacing in The Cloud Roads is superb. It drops the reader right into Moon’s bad day, sketching the outlines of his world right before the action begins and everything changes. The Cloud Roads is a short book and a fast read. It also comes with some beautiful cover art — the thumbnail attached to this review doesn’t do it justice. I recommend The Cloud Roads for readers who are looking for something different, thoughtful, and fun.